Here’s my healthy answer to greasy, salty, calorific Chinese takeout. 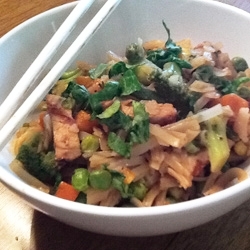 I use whole-grain brown rice noodles, lean chicken breast, and loads of veggies (straight from the freezer!) to keep it slim. Combine the soy sauce, rice wine vinegar, garlic powder, ginger, sesame oil, canola oil, water, sugar, and black pepper in a medium bowl and add the chicken pieces. Cover the bowl and allow the chicken to marinate for at least 15 minutes in the fridge. While the chicken marinates, microwave the frozen vegetables for 3 to 4 minutes, or until fully thawed. Drain the vegetables and set them aside. Prepare the brown rice noodles according to the package directions for stir fry recipes. Coat a large skillet with oil spray and add the chicken (reserving all marinade in the bowl) for about 3 to 4 minutes, or until the chicken is cooked through. Add the vegetables to the skillet. Stir the cornstarch into the reserved marinade. Push the chicken and vegetables to the outskirts of the skillet, forming a well in the center. Add the marinade to the well and bring it to a boil. Then toss the marinade thoroughly with the chicken and veggies to coat. Continue to cook and stir for 1 to 2 minutes. Add the noodles, and continue to cook and toss for another 2 minutes. Garnish with the optional scallions and/or roasted chopped peanuts and serve immediately. *Note: If you have celiac disease, be sure to use a gluten-free soy sauce. Looking for delicious grab-and-go snacks? 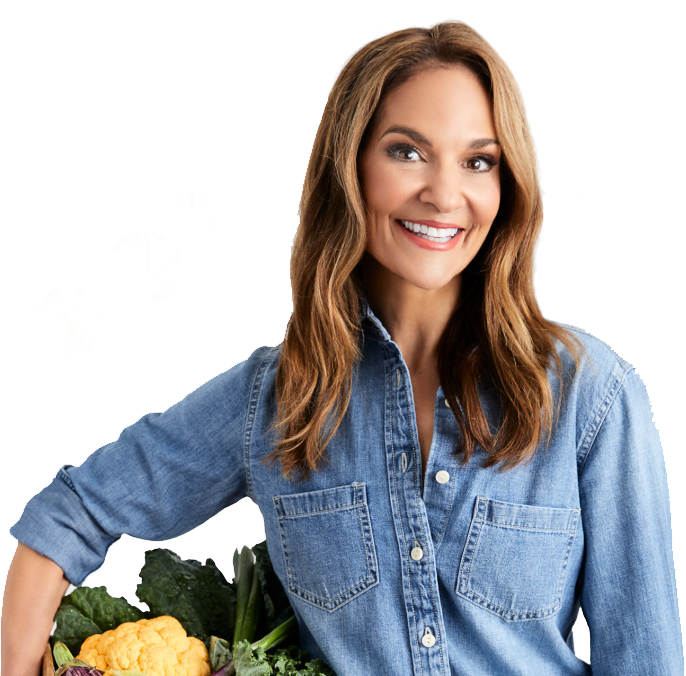 Check out my new line of healthy goodies, Nourish Snacks!